Replace your dirty worn-out NBX handset with a new set making your NBX phone look and sound new again. 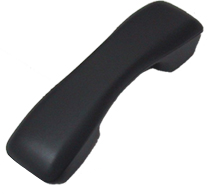 This phone handset will work on the all NBX phone models. Including but not limited to the following models: 1102, 1102B, 1102PE, 2101, 2101B, 2101PE, 2102, 2102B, 2102PE, 3101, 3101A, 3101B, 3101SPKRA, 3101SPKRB, 3102, 3102A, 3102B, 3102C, 3103, 3103A, 3103B.